White with black ear, well placed ears, nice profile and fill under eyes giving a keen expression, good reach of neck into well laid shoulders, straight front and tight feet, short coupled and good rear, moved well. Red and white, a promising young dog requires socialising, flat skull with good profile and down turn, I would like a smaller ear, nice reach of neck, straight front, level top line, good rear angulation, moved nice both ways. White with small well placed ears, strong head with good fill, nice shoulder placement, straight front, short coupled, would like more rear angulation, moved well. White, Strong head well placed ears, one a little soft on the move, lovely in profile and fill, keen dark eye, good reach of neck into well laid shoulders giving a nice forechest, straight front, Level top line, short coupled with good rear angulation, moved with drive both ways. BD, RBOB and BOS. 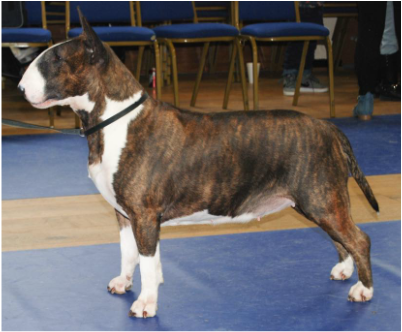 Brindle and white, would have liked a higher ear placement on the day, strong head with down turn, dark keen eye, straight front and tight feet, good shoulder placement, moved with a purpose both ways. Light brindle and white, Small ears well placed, flat skull nice profile and down turn, good reach of neck into lay of shoulder, straight front, tight feet, Level top line, would have liked more rear angulation. covered the ground with ease. Flat skull, with well placed ears, would like more profile and fill, good lay of shoulder and forechest, straight front, well muscled rear, moved with drive. White, nice ear placement, flat skull, good in profile would like more fill under the eye, good reach of neck into well laid shoulders, straight front, Moved well both ways. Red and White, Ears set well back on a flat skull, good in profile, would like more fill under the eyes, small keen eye, good reach of neck, straight front with tight feet, level top line, good rear angulation, moved with drive.